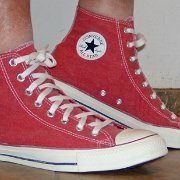 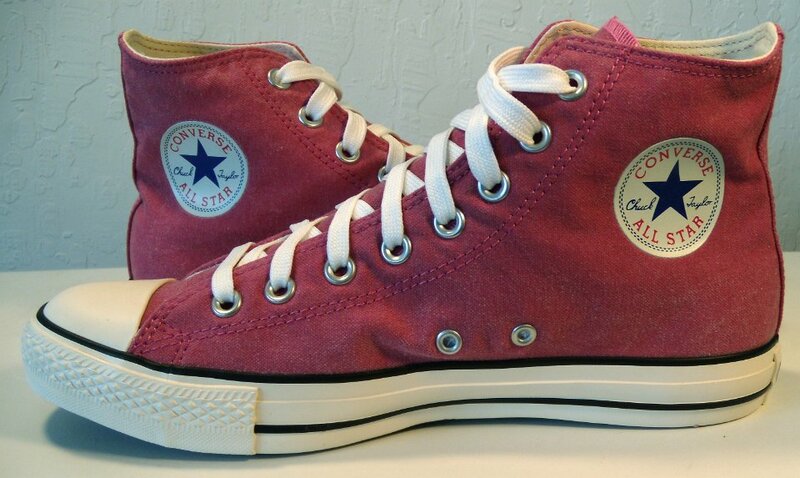 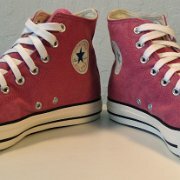 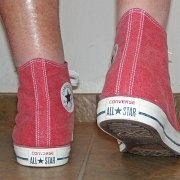 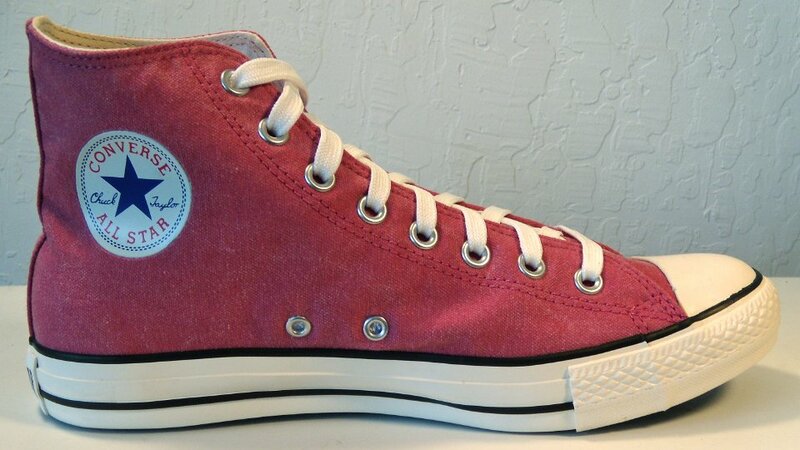 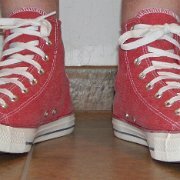 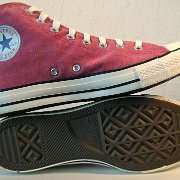 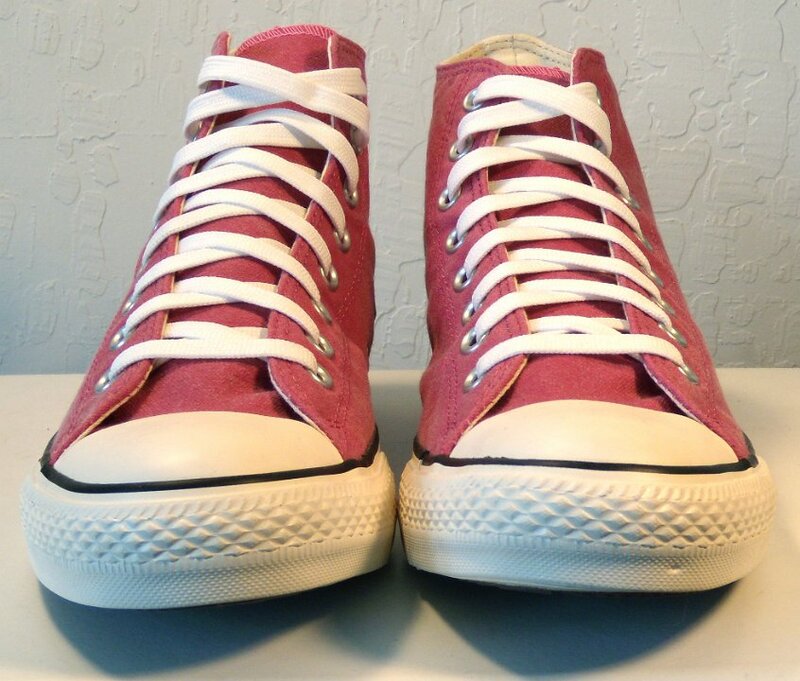 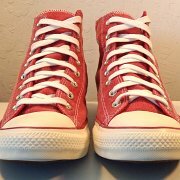 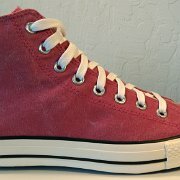 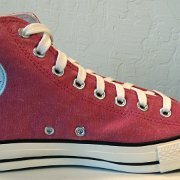 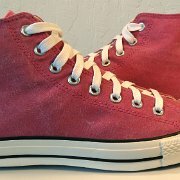 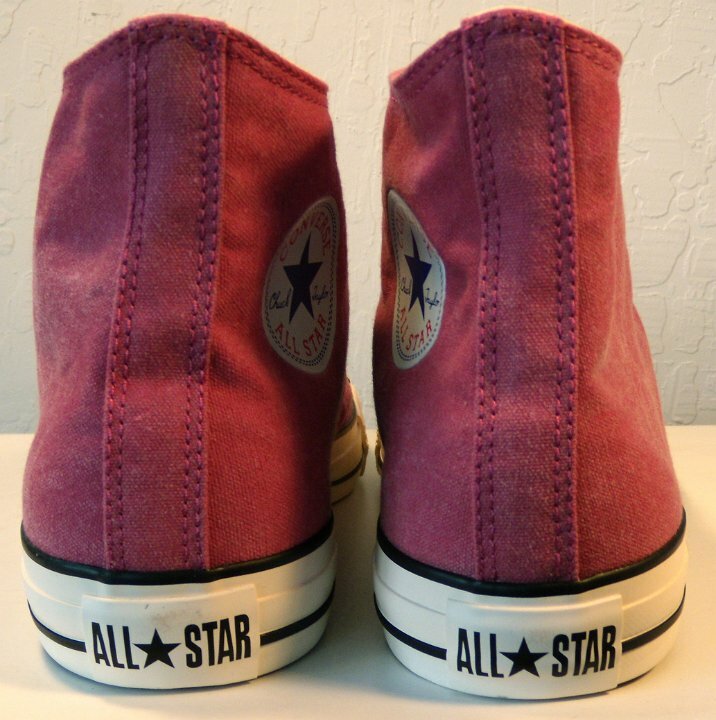 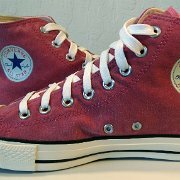 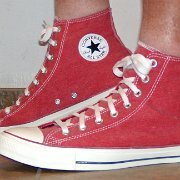 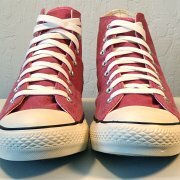 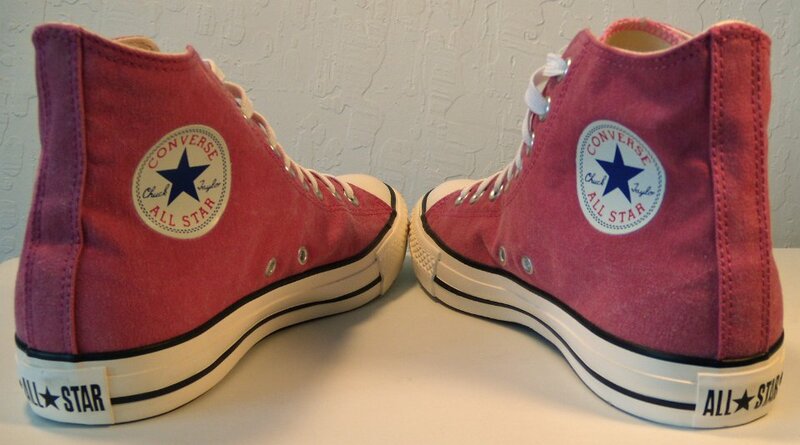 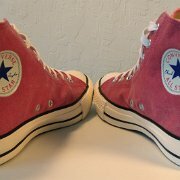 Photo gallery of red stonewashed canvas high top chucks. 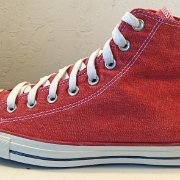 1 2017 Red Stonewashed High Top Chucks Inside patch view of a 2017 right red stonewashed canvas high top. 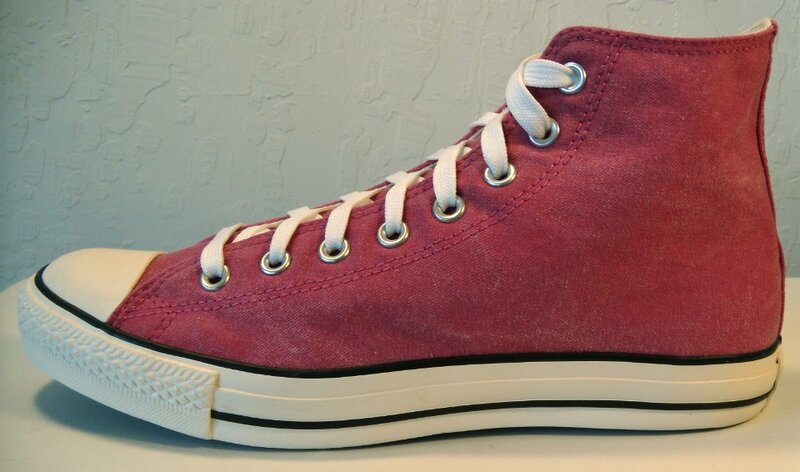 2 2017 Red Stonewashed High Top Chucks Outside view of a right 2017 red stonewashed canvas high top. 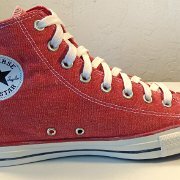 3 2017 Red Stonewashed High Top Chucks Inside patch view of a left 2017 red stonewashed canvas high top. 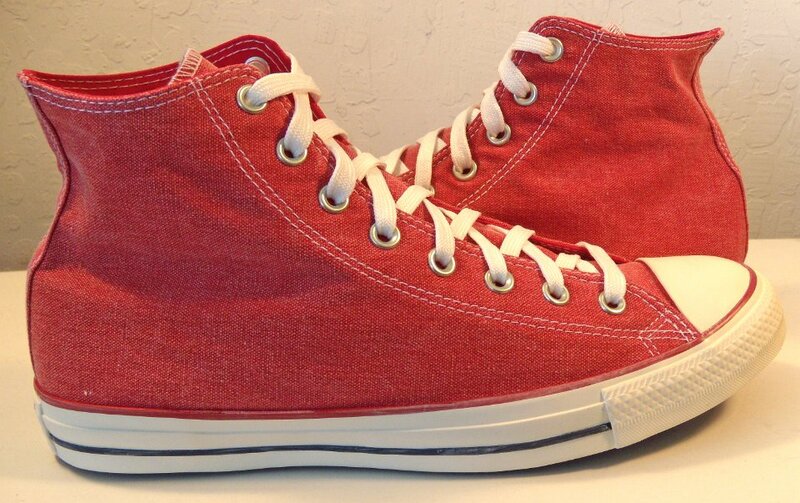 4 2017 Red Stonewashed High Top Chucks Outside view of a left 2017 red stonewashed canvas high top. 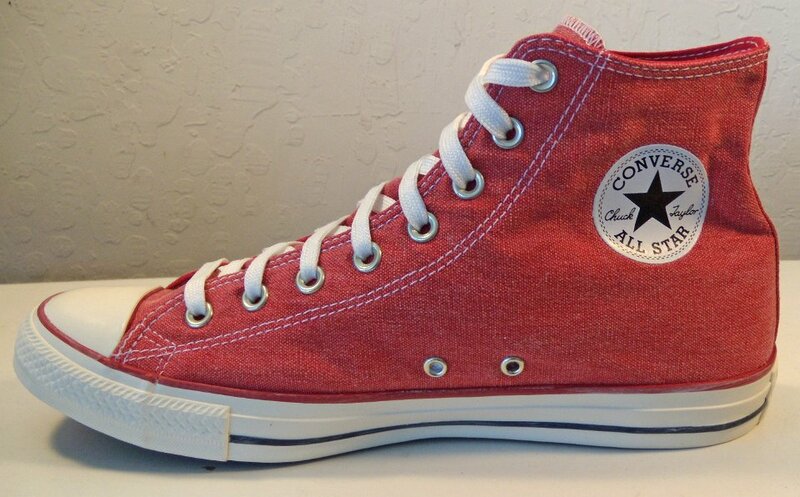 5 2017 Red Stonewashed High Top Chucks Rear view of 2017 red stonewashed canvas high tops. 6 2017 Red Stonewashed High Top Chucks Angled rear view of 2017 red stonewashed canvas high tops. 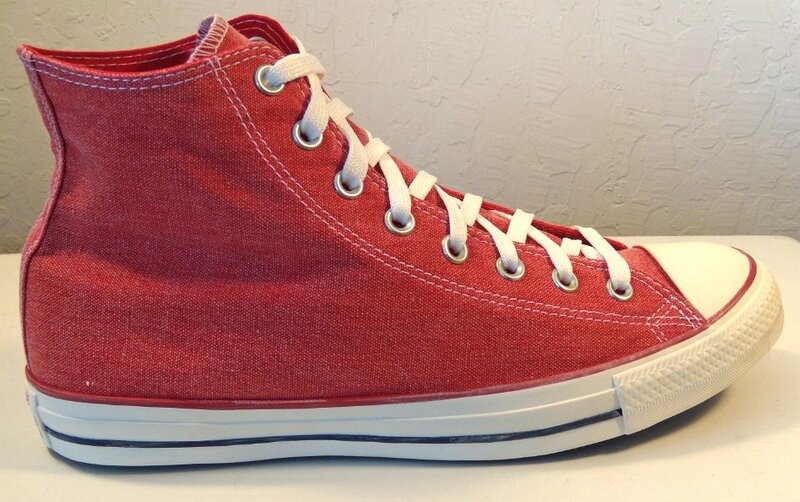 7 2017 Red Stonewashed High Top Chucks Angled side view of 2017 red stonewashed canvas high tops. 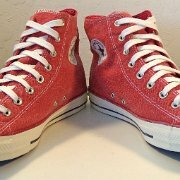 8 2017 Red Stonewashed High Top Chucks Front view of red 2017 stonewashed canvas high tops. 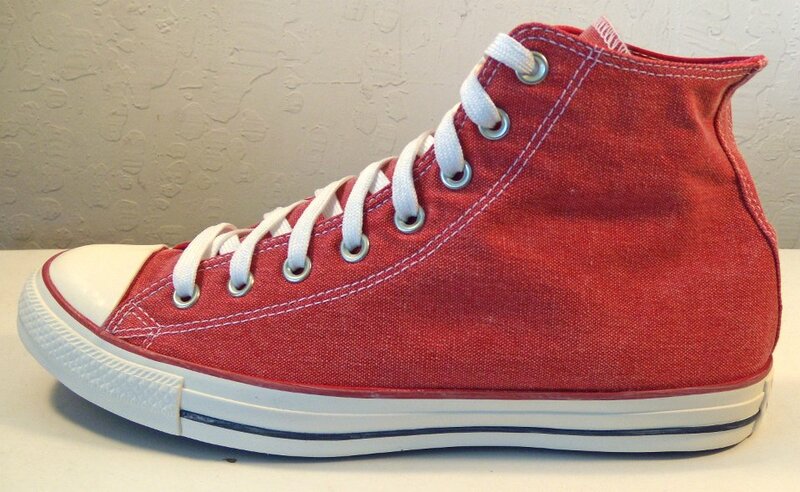 9 2017 Red Stonewashed High Top Chucks Angled front view of 2017 red stonewashed canvas high tops. 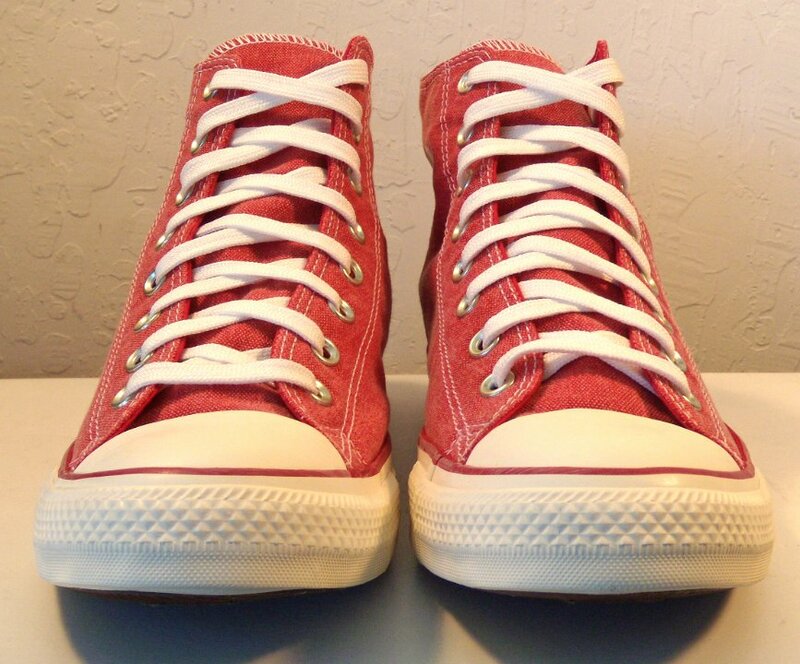 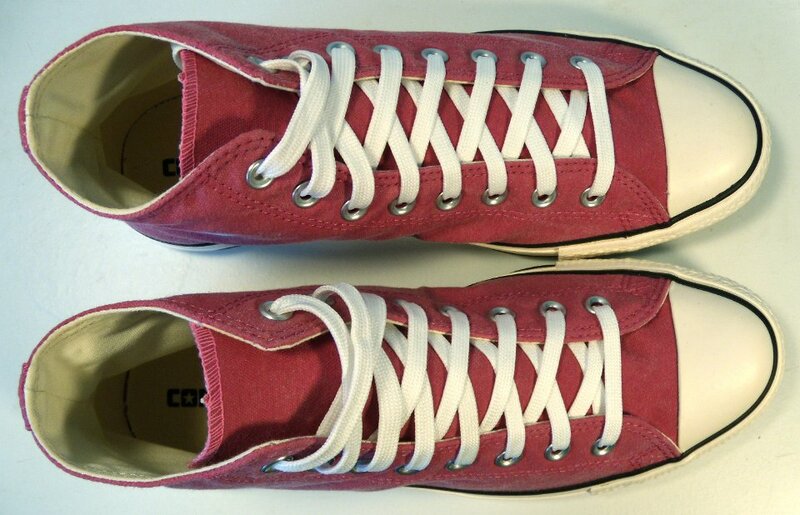 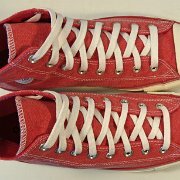 10 2017 Red Stonewashed High Top Chucks Top view of 2017 red stonewashed canvas high tops. 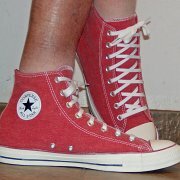 11 2017 Red Stonewashed High Top Chucks Inside patch views of 2011 red stonewashed canvas high tops. 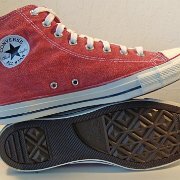 12 2017 Red Stonewashed High Top Chucks Outside views of 2017 red stonewashed canvas high tops. 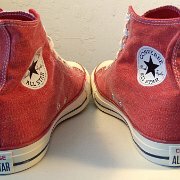 13 2017 Red Stonewashed High Top Chucks Inside patch and sole views of 2017 red stonewashed canvas high tops. 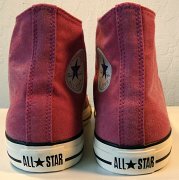 14 2017 Red Stonewashed High Top Chucks Insole and product label view of 2017 red stonewashed high top. 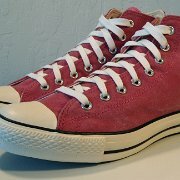 15 2017 Red Stonewashed High Top Chucks Wearing 2017 stonewashed red high tops, front view 1. 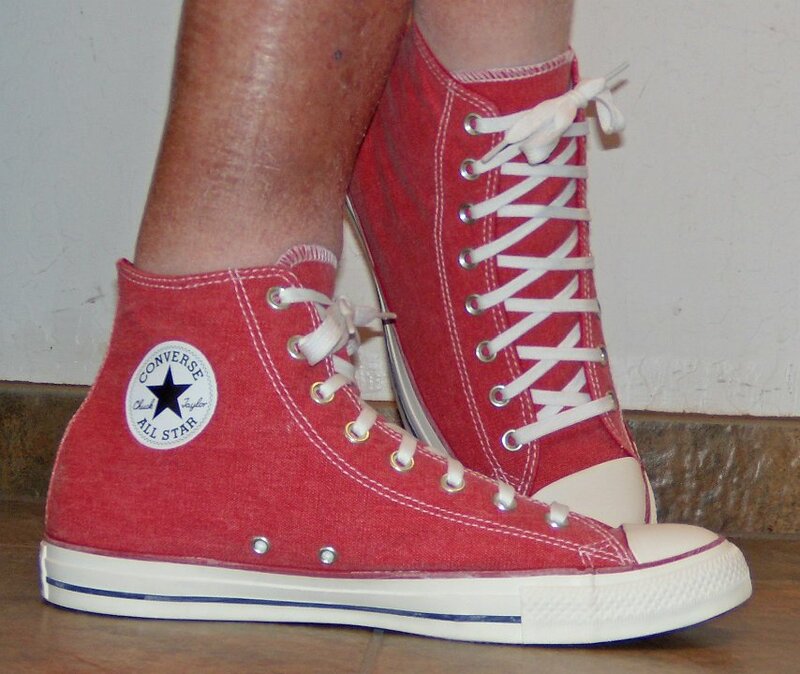 16 2017 Red Stonewashed High Top Chucks Wearing 2017 stonewashed red high tops, front view 2. 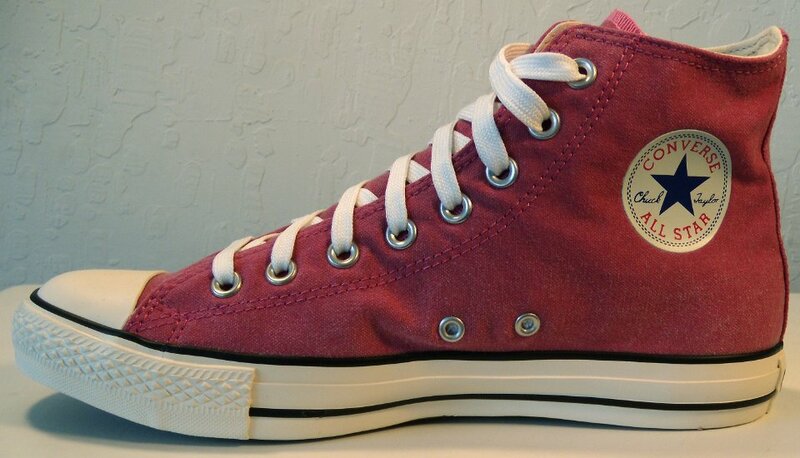 17 2017 Red Stonewashed High Top Chucks Wearing 2017 stonewashed red high tops, right view 1. 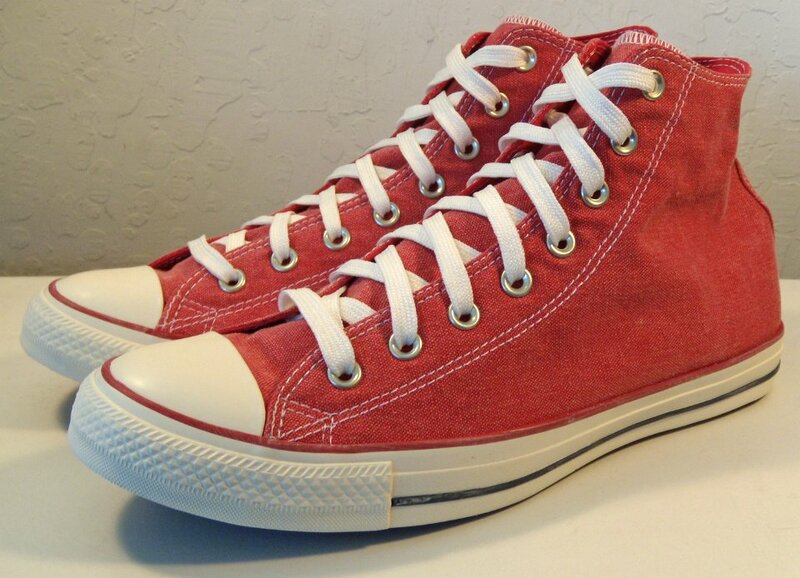 18 2017 Red Stonewashed High Top Chucks Wearing 2017 stonewashed red high tops, right view 2. 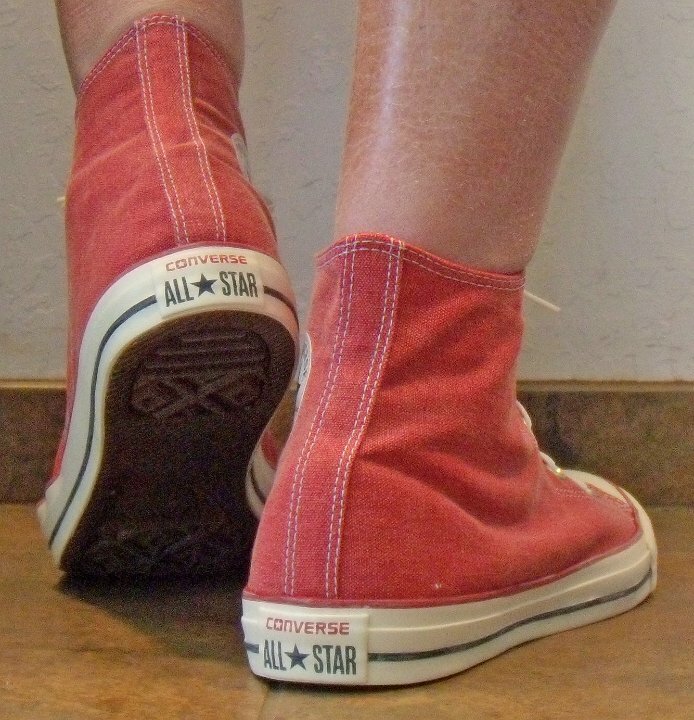 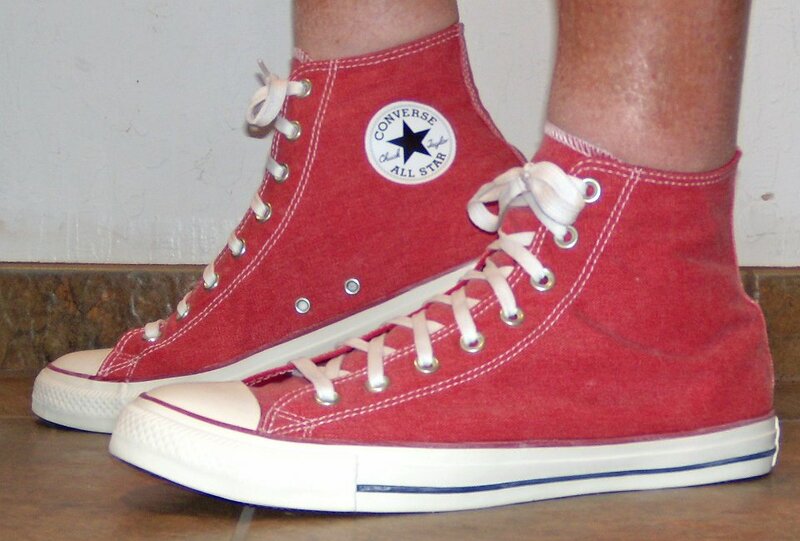 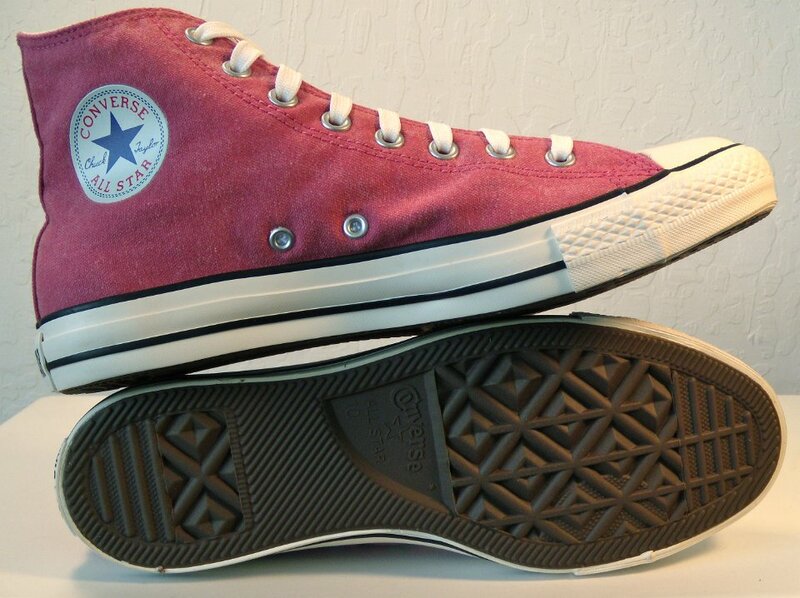 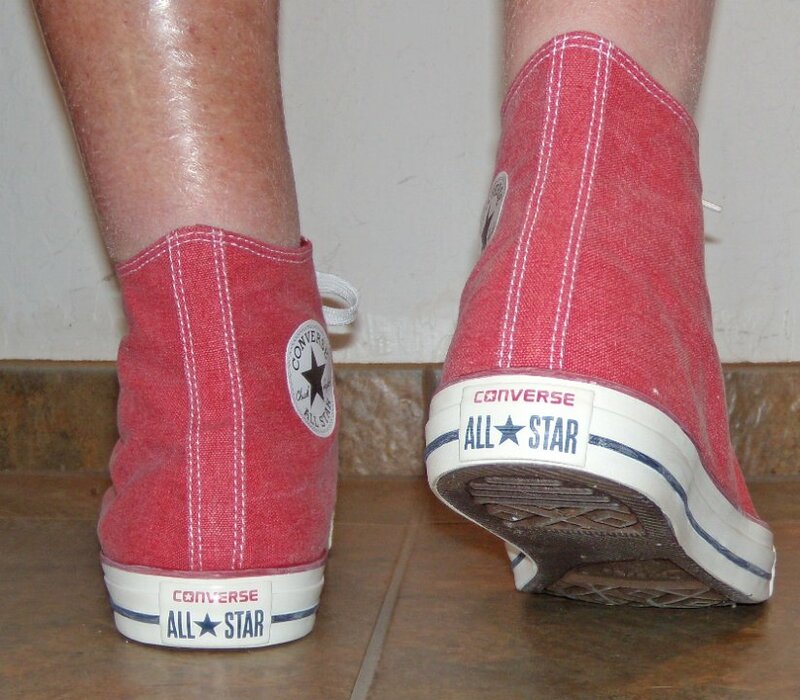 19 2017 Red Stonewashed High Top Chucks Wearing 2017 stonewashed red high tops, rear view 1. 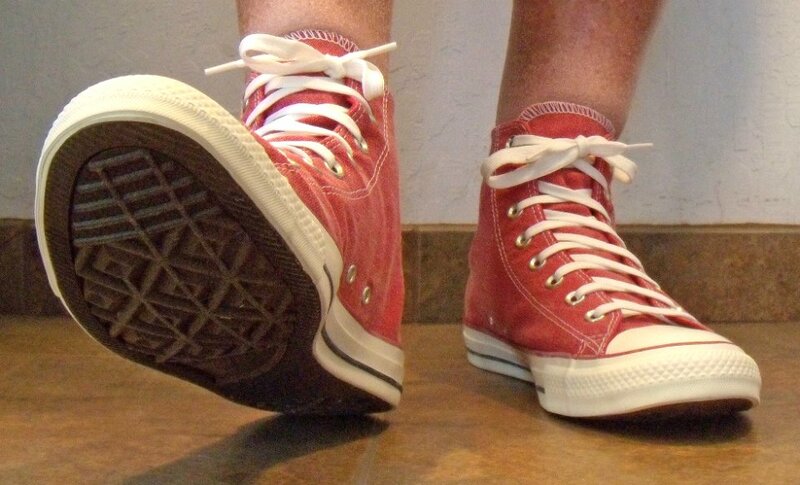 20 2017 Red Stonewashed High Top Chucks Wearing 2017 stonewashed red high tops, rear view 2. 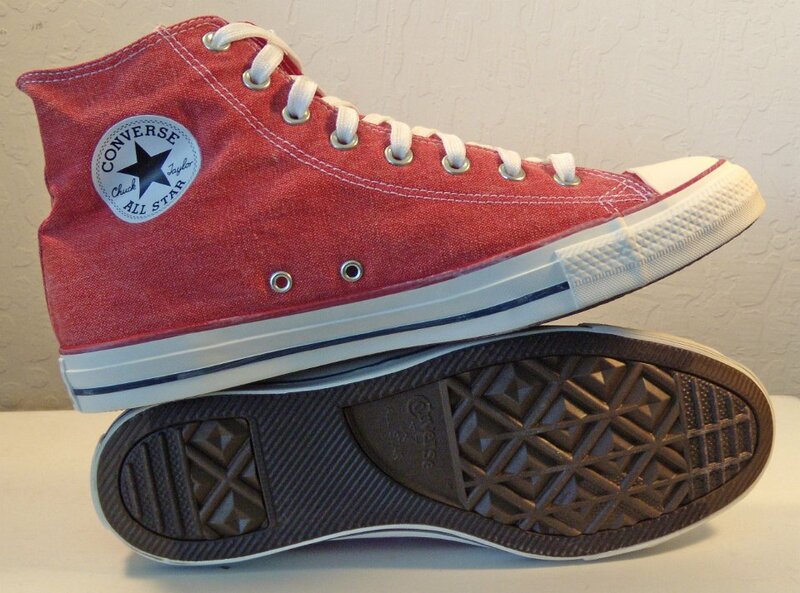 21 2017 Red Stonewashed High Top Chucks Wearing 2017 stonewashed red high tops, left view 1. 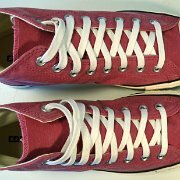 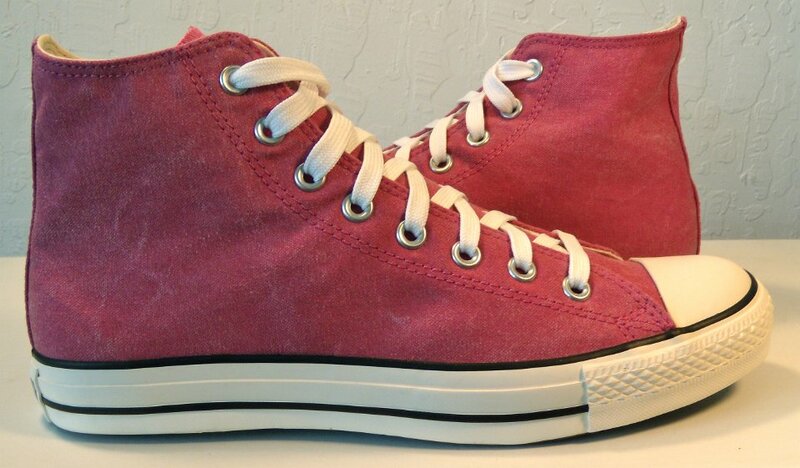 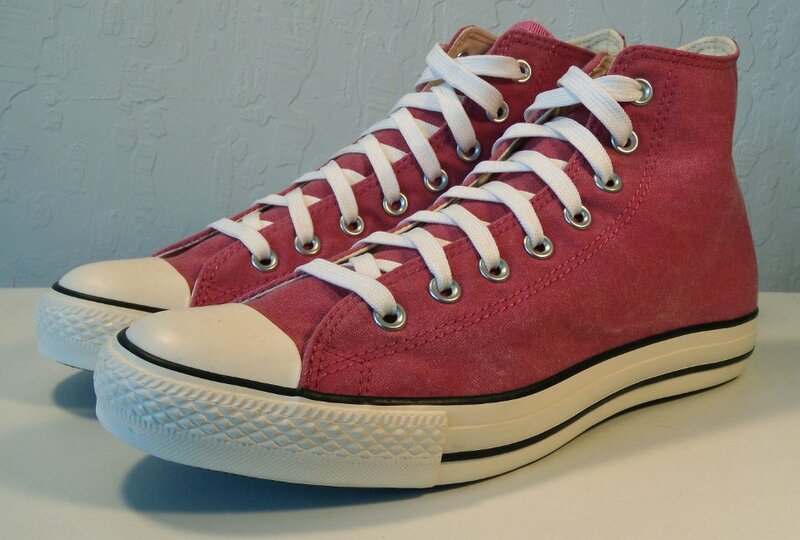 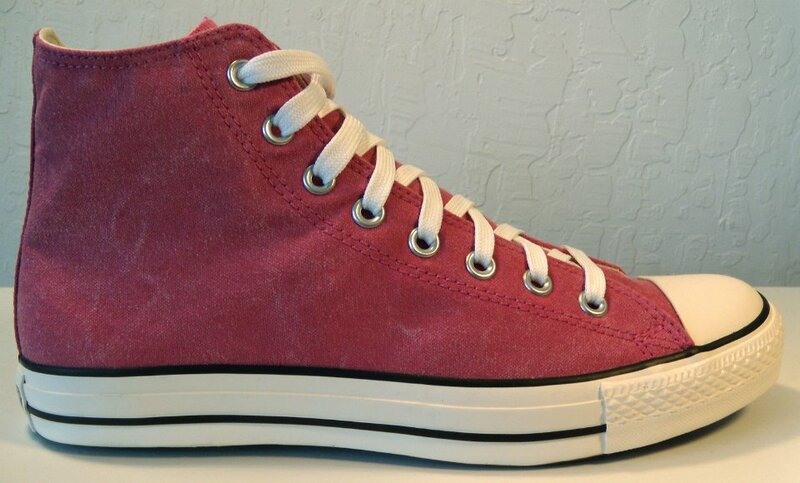 22 2017 Red Stonewashed High Top Chucks Wearing 2017 stonewashed red high tops, left view 2. 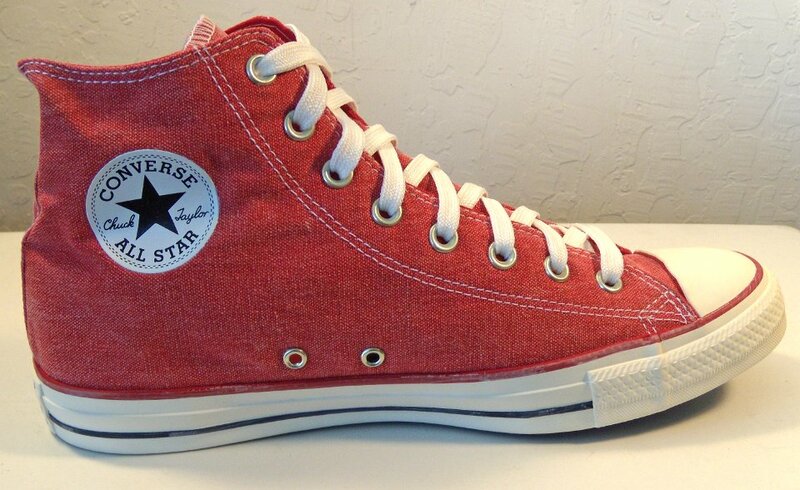 23 2011 Red Stonewashed Canvas High Top Chucks Inside patch view of a 2011 right red stonewashed canvas high top. 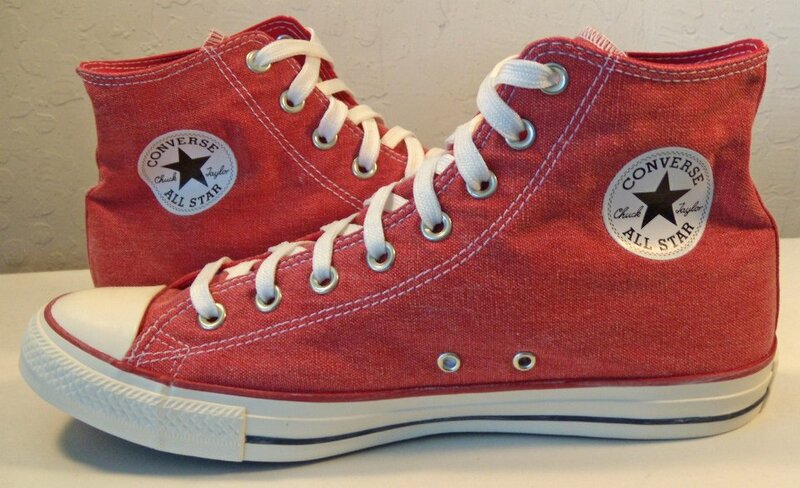 24 2011 Red Stonewashed Canvas High Top Chucks Outside view of a right 2011 red stonewashed canvas high top. 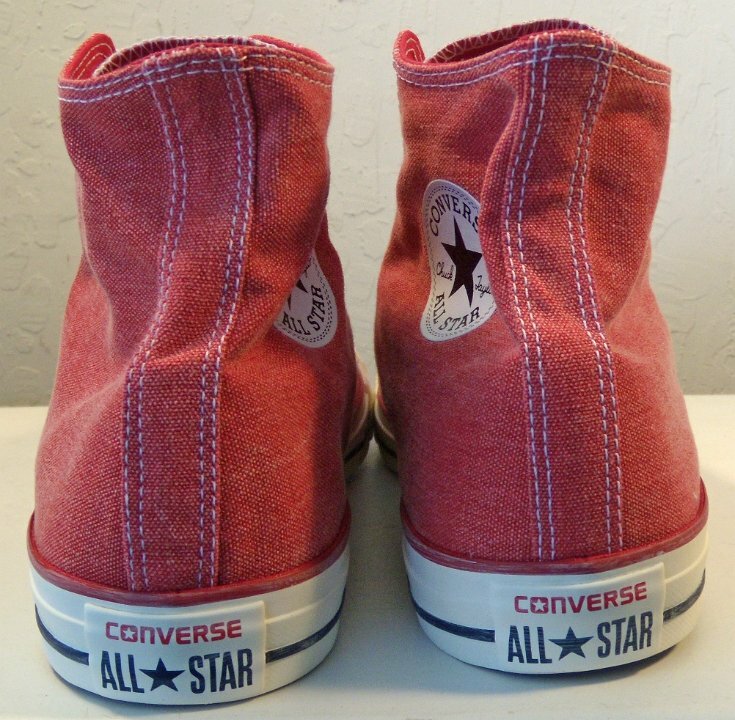 25 2011 Red Stonewashed Canvas High Top Chucks Inside patch view of a left 2011 red stonewashed canvas high top. 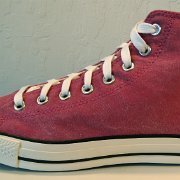 26 2011 Red Stonewashed Canvas High Top Chuckss Outside view of a left 2011 red stonewashed canvas high top. 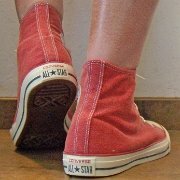 27 2011 Red Stonewashed Canvas High Top Chucks Rear view of 2011 red stonewashed canvas high tops. 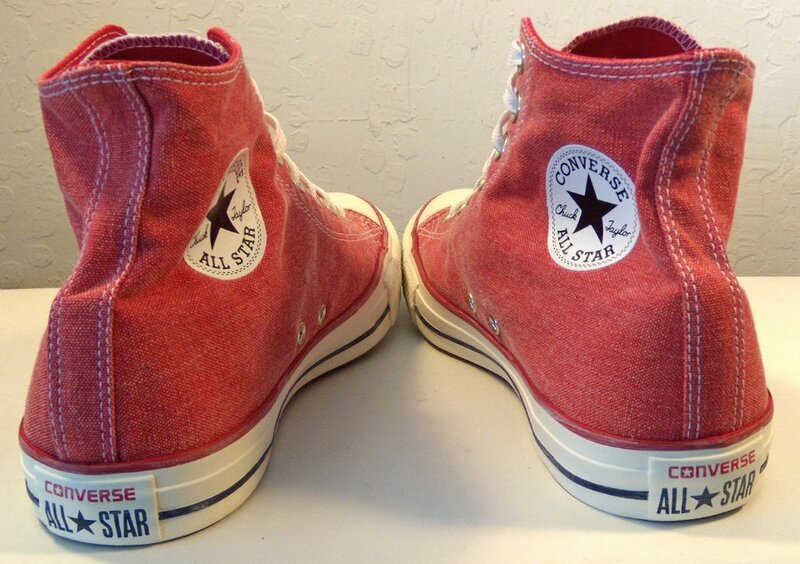 28 2011 Red Stonewashed Canvas High Top Chucks Angled rear view of 2011 red stonewashed canvas high tops. 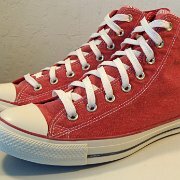 29 2011 Red Stonewashed Canvas High Top Chucks Angled side view of 2011 red stonewashed canvas high tops. 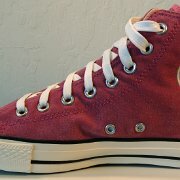 30 2011 Red Stonewashed Canvas High Top Chucks Angled front view of 2011 red stonewashed canvas high tops. 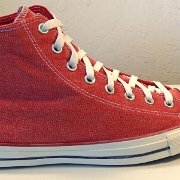 31 2011 Red Stonewashed Canvas High Top Chucks Front view of red 2011 stonewashed canvas high tops. 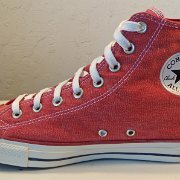 32 2011 Red Stonewashed Canvas High Top Chucks Top view of 2011 red stonewashed canvas high tops. 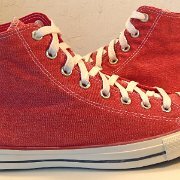 33 2011 Red Stonewashed Canvas High Top Chucks Inside patch views of 2011 red stonewashed canvas high tops. 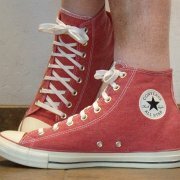 34 2011 Red Stonewashed Canvas High Top Chucks Outside views of 2011 red stonewashed canvas high tops. 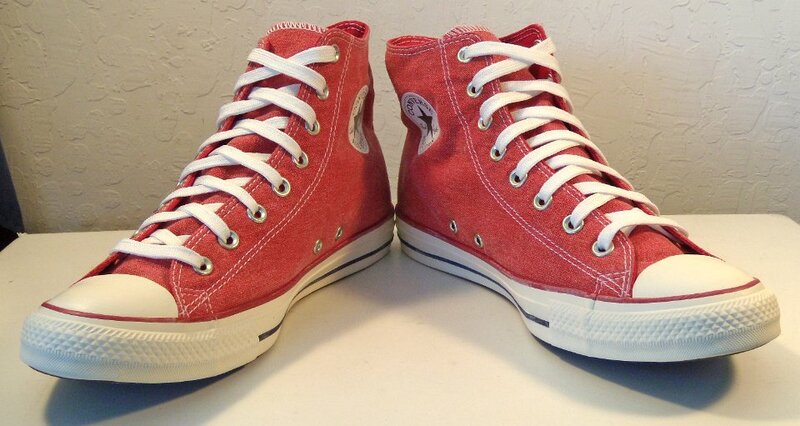 35 2011 Red Stonewashed Canvas High Top Chucks Inside patch and sole views of 2011 red stonewashed canvas high tops. 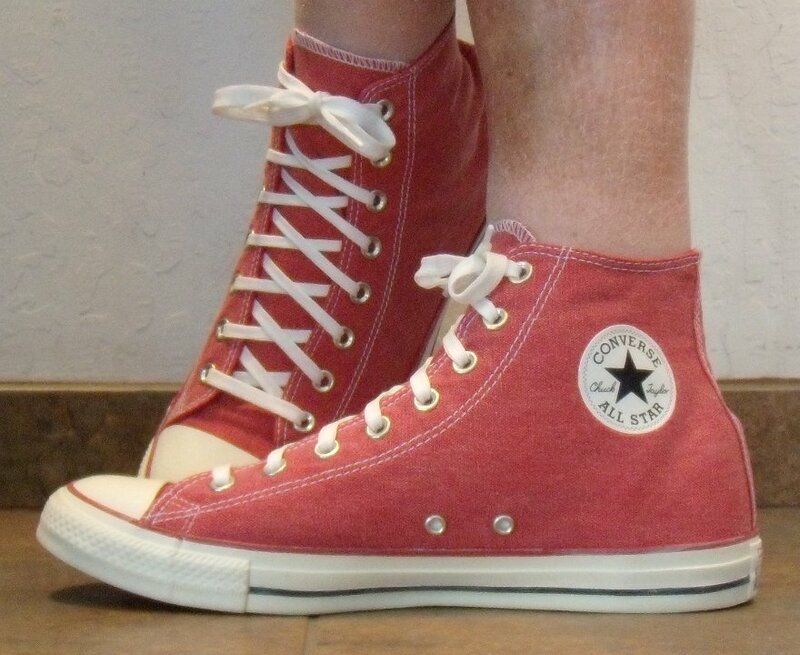 Stonewashed canvas chucks were introduced in 2011. 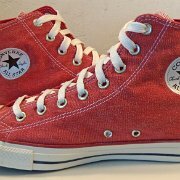 They are high tops that feature a canvas look similar to that of stonewashed jeans. 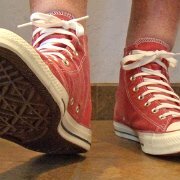 The 2011 issue had matching red thread on the canvas uppers, all black racing stripes, a red white and blue ankle patch, and balck and white heel patch. 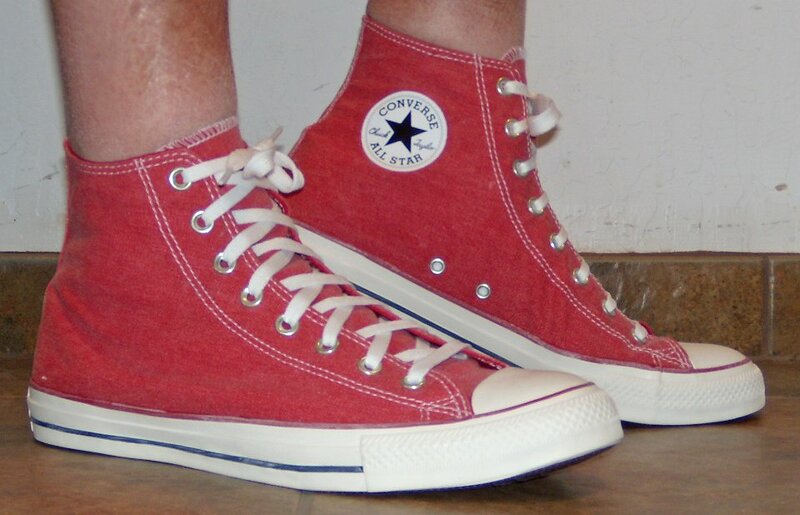 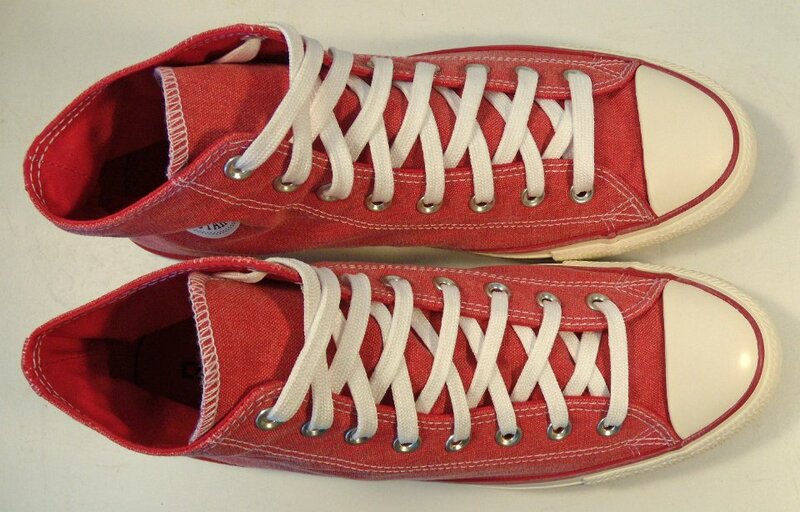 The 2017 issue used white thread on the canvas uppers, a red racing stripe around the toe caps and upper foxing and a blue lower stripe, a black and white ankle patch, and red and blue heel patch with the word Converse in red. 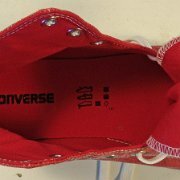 The insole and inner canvas of the 2017 model is all red.